SermonAudio Summary: "Recently Donald Trump caused quite a still by calling for the a moratorium on Muslims entering into the US. Many in the media immediately pounced on the statement as proof of how mean-spirited and anti-American Trump's policies can be. Most of the other GOP candidates, in addition to the Democratic candidates voiced their opposition to Trump's proposal as well. And many Evangelical Leaders followed suite. But is the proposal really that outlandish? Especially when we consider the history of Islam, as well as the current reign of terror committed by certain Islamic groups. On the program today, I will be joined by author/ speaker William J. Federer. We will discuss the history of Islam." 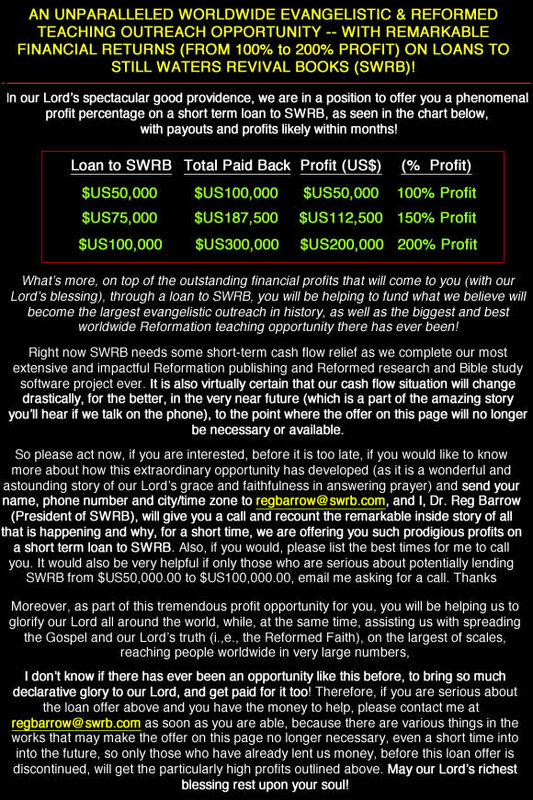 As usual SWRB does not necessarily agree with every point made in every resource or landing page to which we link -- we only agree with that which is in accord with the what God teaches in the Bible. In fact, when the classic historicist position is studied, the fulfillment in the case of Islam and Revelation chapter nine is seen to be so striking and well attested that 'even advocates of other approaches who are adamant in their rejection of the historicist system of interpretation have admitted the convincing nature of this particular identification.' - Steve Gregg, commenting on Revelation 9:1-6 in Revelation: Four Views: A Parallel Commentary, p. 176).